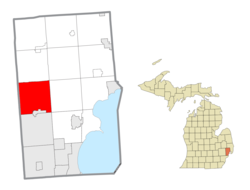 Not to be confused with Shelby Township in Oceana County. Preston Corners is located at the corner of 25 Mile and Schoenherr roads at 42°41′58″N 82°59′45″W﻿ / ﻿42.69944°N 82.99583°W﻿ / 42.69944; -82.99583﻿ (Preston Corners). Ira and Deborah Preston bought 400 acres (1.6 km2) of land from the United States government in 1826 and settled on it the following year, later building a sawmill and a picket fence factory. Shelby is located at Shelby and 25 Mile Roads (42°41′51″N 83°04′10″W﻿ / ﻿42.69750°N 83.06944°W﻿ / 42.69750; -83.06944). Shelby Village is located where Auburn and Ryan roads intersect. Housing was built in this area in the 1940s. Yates is on the boundary with Rochester and Rochester Hills, Oakland County (42°40′25″N 83°05′45″W﻿ / ﻿42.67361°N 83.09583°W﻿ / 42.67361; -83.09583 ; Elevation: 669 ft./204 m.). The U.S. Census Bureau has also defined Shelby Charter Township as a census-designated place (CDP) in the 2000 Census so that the community would appear on the list of places (like cities and villages) as well on the list of county subdivisions (like other townships). The final statistics for the township and the CDP are identical. As of the census of 2010, there were 73,804 people, 28,299 households, and 17,923 families residing in the township. The racial makeup of the township was 89.4% White, 3.1% African American, 3.3% Asian, 0.3% from other races, and 1.5% from two or more races. Hispanic or Latino of any race were 2.4% of the population. As of the census of 2000, there were 65,159 people, 24,486 households, and 17,923 families residing in the township. The population density was 1,878.7 per square mile (725.4/km²). There were 25,265 housing units at an average density of 728.5 per square mile (281.3/km²). The racial makeup of the township was 94.95% White, 0.85% African American, 0.24% Native American, 2.11% Asian, 0.02% Pacific Islander, 0.45% from other races, and 1.38% from two or more races. Hispanic or Latino of any race were 1.71% of the population. There were 24,486 households out of which 33.7% had children under the age of 18 living with them, 62.6% were married couples living together, 7.3% had a female householder with no husband present, and 26.8% were non-families. 21.6% of all households were made up of individuals and 6.6% had someone living alone who was 65 years of age or older. The average household size was 2.65 and the average family size was 3.13. In the township the population dispersal was 24.9% under the age of 18, 8.5% from 18 to 24, 31.0% from 25 to 44, 25.1% from 45 to 64, and 10.5% who were 65 years of age or older. The median age was 37 years. For every 100 females, there were 99.6 males. For every 100 females age 18 and over, there were 97.7 males. The median income for a household in the township was $65,291, and the median income for a family was $76,312, making Shelby Charter Township one of the most affluent areas in Michigan. Males had a median income of $59,380 versus $33,844 for females. The per capita income for the township was $30,131. About 2.7% of families and 3.7% of the population were below the poverty line, including 4.1% of those under age 18 and 5.1% of those age 65 or over. The majority of residents are zoned into Utica Community Schools, which serves parts of the communities of Sterling Heights, Macomb Township, Washington Township, and Ray Township, as well as most of Shelby Charter Township, and all of Utica. However, a small number of residents are zoned into Romeo Community Schools. According to the United States Census Bureau, the township has a total area of 35.2 square miles (91 km2), of which 34.7 square miles (90 km2) is land and 0.5 square miles (1.3 km2) (1.53%) is water. Shelby Charter Township has a Supervisor-Board style township government with elected supervisor, clerk, treasurer and four trustees. The Township operates the Shelby Township Library as well as Cherry Creek Golf Course. Shelby Township was set off by an act of the Michigan Territorial Legislature on April 12, 1827, and a civil government was organized the following May. It originally included the area that is now Sterling Heights, which was set off March 17, 1835, as the township of Jefferson, renamed to Sterling on March 6, 1838. Utica, located on the southern edge of the township, originally incorporated as a village on March 9, 1838, although that corporation was dissolved soon afterwards. The village incorporated a second time on May 10, 1877. The village of Disco (42°41′02″N 83°02′04″W﻿ / ﻿42.68389°N 83.03444°W﻿ / 42.68389; -83.03444﻿ (Disco)) was located at what is now the junction of 24 Mile Road and Van Dyke Road. and was platted in 1849. The community never incorporated, although the local high school, the "Disco Academy" gained some local recognition and a post office operated named Disco from May 5, 1854, until July 31, 1906. Only a few homes and a namesake on old county road maps remain of this now forgotten historic place. See also: "The Lost Village of Disco" on the Shelby Township Historical Society website. M-59 commonly called Hall Road when the expressway ends - which is the east-west connector from just north of Mount Clemens, through Utica as a surface road, and then becomes a limited access freeway to Pontiac, Michigan, being the main northern connector between Macomb County and Oakland County. Stony Creek Metropark, predominantly located in Washington Township, and Oakland County; a small portion of the park extends into Shelby Charter Township. The park includes two beaches, golf courses, a nature center, a boat launch, picnic areas, basketball courts, a zip-line park and more. Yates Cider Mill and Yates Park, predominantly located in Shelby Charter TWP, with a small portion located in Rochester Hills and Rochester. The water-powered cider mill near the Clinton River includes a confectionery and cider shop, picnic and fishing areas, hiking trails and more. Macomb Orchard Trail, partially located in Shelby Charter TWP, is a 23.7 mile hiking trail that stretches from Shelby Charter TWP, at its connection with the Clinton River Trail, through northern Macomb County. ^ "Charter Township of Shelby". Geographic Names Information System. United States Geological Survey. ^ "Shelby Township Statistics". United States Census Bureau. Retrieved 2009-08-03. 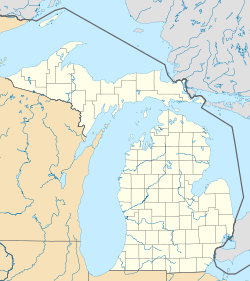 ^ a b c "Macomb County" (PDF). County Maps. Michigan Department of Technology, Management, and Budget. Retrieved 6 February 2012. ^ "Preston Corners". Geographic Names Information System. United States Geological Survey. ^ Romig, Walter (1986) . Michigan Place Names. Detroit, Michigan: Wayne State University Press. pp. 459–460. ISBN 0-8143-1838-X. ^ "Navigate Your Neighborhood Libraries" (PDF). Suburban Library Cooperative. pp. "12"/5. Retrieved 7 February 2012. ^ Leeson, Michael A. (2005) . "Shelby Township". History of Macomb County, Michigan. Ann Arbor, Mich.: University of Michigan Library. pp. 717–742. Retrieved 2006-10-01. ^ Eldredge, Robert F. (2005) . "Shelby Township". Past and present of Macomb County, Michigan. Ann Arbor, Mich.: University of Michigan Library. pp. 646–652. Retrieved 2006-10-01. ^ "Disco, Michigan". Geographic Names Information System. United States Geological Survey. retrieved 2014-03-22. This page was last edited on 13 April 2019, at 05:21 (UTC).